The Plant Fill object allows you to populate an area of your landscape design with plants. Up to 8 different types of plants and 500 total plants can be used in each Plant Fill object. Plant fills can be designed in any shape and size needed, including shapes with holes. 1. Click the Add Plant Fill button found near the top of the screen under the Landscape tab. 2. Draw the outline of the plant fill by clicking the left mouse button to add points. Press the Backspace key to remove the last point added, and press the Esc key to cancel. If you would like to input the distance and angle manually, place at least one point and then press the Enter key. See Entering Angle and Distance for details. 3. To finish drawing the plant fill, place the last point on top of the first point. Alternately, right-click to place the last point. 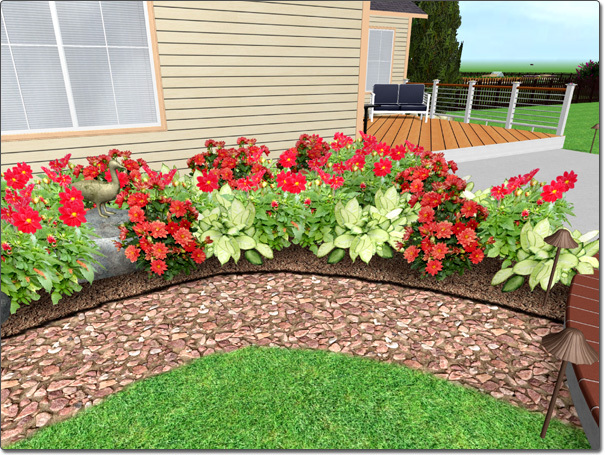 The plants in the landscape design shown below were automatically added using the Plant Fill object.